BELIEFS #1 BUZZ in this week’s issue of NME MAGAZINE! 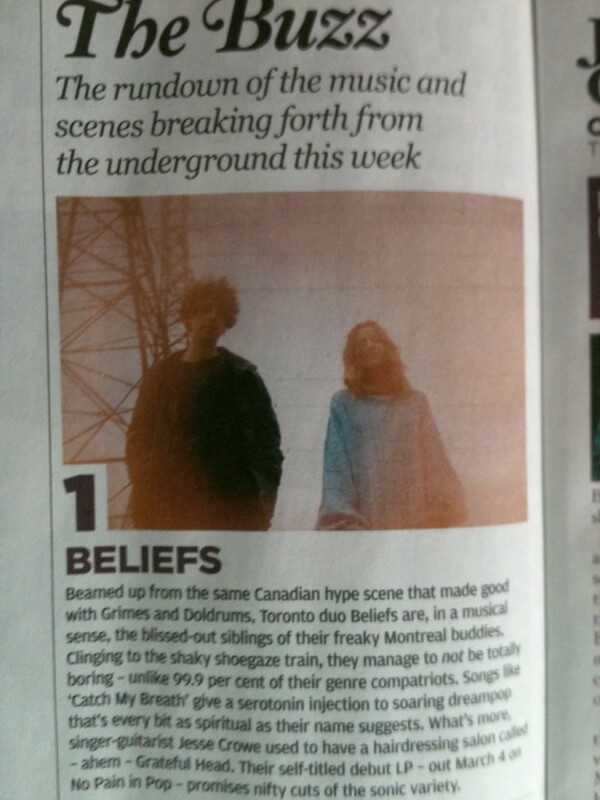 Beamed up from the same Canadian hype scene that made good with Grimes and Doldrums, Toronto duo Beliefs are, in a musical sense, the blissed-out siblings of their freaky Montreal buddies. Clinging to the shaky shoegaze train, they manage to not be totally boring – unlike 99.9 per cent of their genre compatriots. Songs like ‘Catch My Breath’ give a serotonin injection to soaring dreampop that’s every bit as spiritual as their name suggests. What’s more, singer-guitarist Jesse Crowe used to have a hairdressing salon called – ahem – Grateful Head. Their self-titled debut LP – out March 4 on No Pain In Pop [March 5th on Hand Drawn Dracula & Manimal] – promises nifty cuts of the sonic variety. BELIEFS STREAM VIA DAZED & EXCLAIM!